For the past month, I can crawl and fall asleep completely in bed without moisturizing my clean skin with Skin Authority’s Moisturizing Lift Cream. I love it! So, I can’t help, but to want to buy and try their Tie-The-Knot kit, despite not tying the knot anytime in the near future. Keep reading to see what comes in the kit! Shopping Chronicles: A desk full of beauty! When I arrived to work today, my Gilt order with my Kenneth Jay Lane Lipstick necklace and my Nordstrom’s order with my MAC Fix + and Viva Glam Gaga lipstick (FINALLY!) were sitting were waiting for me on my desk. 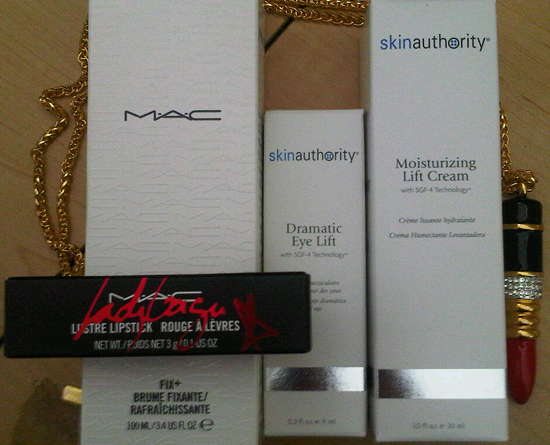 Also, the people over at Skin Authority sent me their Moisturizing Lift Cream and Dramatic Eye Lift products to try out, which I can’t wait. My anti-aging products are running dry as well as my skin.